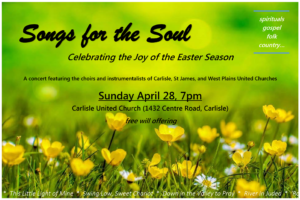 Songs for the Soul The 3 Church Choirs of St. James (Waterdown), Carlisle, and West Plains, will host a joint musical event celebrating the joy of the Easter season and the warm spring sunshine. This concert will feature the choirs, soloists, and instrumentalists of Carlisle, St James, and West Plains United Churches, including the children's choir The Songbirds of Waterdown. The variety of musical styles promises something for everyone: spirituals, gospel, folk, country… and even a little Elvis! All are welcome to come enjoy songs such as Down in the Valley to Pray and Swing Low, Sweet Chariot, and to learn about the stories behind some of our favourite tunes. Refreshments to follow. Free will offerings are accepted with thanks. Reverse and Clash Young talents, Sunshine Quan (harp and zither) and Haoyuan Tong (violin) will grace us with their gifts of music in a special fundraising concert. Freewill offerings will go towards the West Plains Air Conditioning Fund. All welcome, bring friends!